Another Great Teacher Onizuka Fansite:- Image gallery. NEWS: Now this section is now put under the same server with the main website, so the "complaints" about fateback.com being slow should not apply anymore. All pages at http://gtogaleri.yoll.net and http://gtogaleri.topcities.com will be deleted soon. 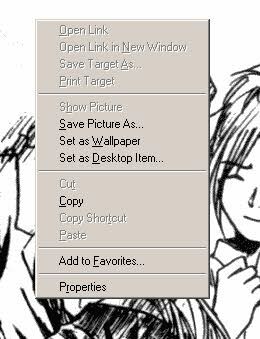 To save any pictures you want, just right-click on them and select the correct option depending on your browser. Warning to all Internet Explorer 6.0 users, if you are viewing large pictures, especially in the wallpaper section, Internet Explorer sometimes will automatically shrinks the image file to fit your browser window. If that happened, just hover your mouse pointer on the picture until a orange icon emerges at the bottom right of the image. 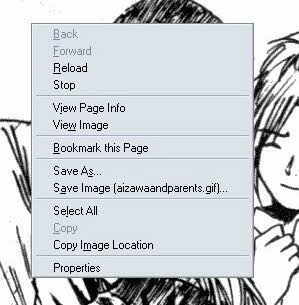 Click on it and the image size will be restored. Internet Explorer 5.x right-click menu.